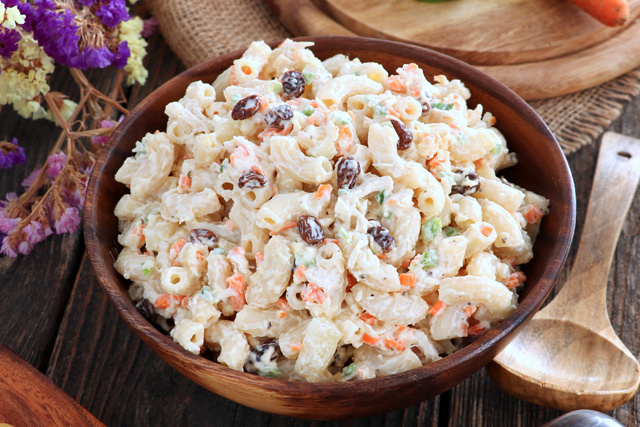 Try this easy chicken macaroni salad recipe, loaded with shredded chicken, onions, carrots, and bell peppers. With a little sweet surprise from raisins and pineapple tidbits. 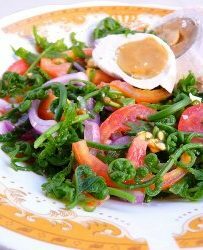 Perfect as a side dish or even as a snack. Making this chicken macaroni salad has made me feel all nostalgic. You see, even at a young age, our parents saw to it that we know what responsibility means. They did so by assigning each one of us specific house chores. Like, I was assigned to clean the bedrooms while my older brother, Norman, was in charge of the living and dining room. Andrea has the toilet and Glenda the stairwell. 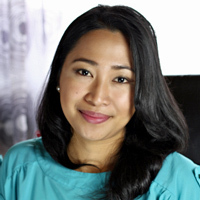 Dawn was just a baby then so she was exempted but later on, she also got a timeslot for dishwashing, which is like the initiation to the various level of tasks that depends on your age. In addition to my daily chores, being the eldest daughter, I was the designated kitchen assistant to our Mama. That means spending longs hours in the kitchen when we have to prepare for an occasion or for the holidays. The first task I remember having is to stir the leche flan mixture …very slowly. I remember I needed to kneel on top of a chair to do it because I was not able to do it standing up from the floor. Next assignment my Mama gave me was to peel and cut onions and other vegetables. I can still remember how I hated chopping onions because of the all the tears it entails. Or how boring it was to cut carrots, bell peppers and celery in julienne or brunoise (really tiny cubes) for a Lumpiang Shanghai, macaroni salad and pancit. She was also very specific about having the uniform size and shape, as much as possible. It would take me hours to finish chopping all the things she needed. There were usually loads of them since we usually prepare food for at least a hundred people in those days. Every year, my Mama would let me do more than just chopping things. I was allowed to season and mix things! 🙂 And then, later on, I was promoted to make the desserts and salads on my own. 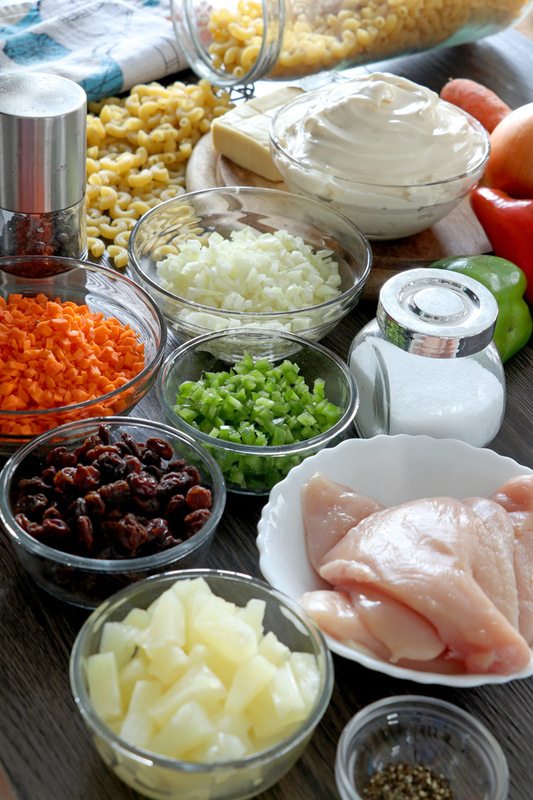 While making this chicken macaroni salad and chopping the carrots, bell peppers and onions, the memory of those years spent chopping away vegetables came rushing back. But instead of feeling hatred or boredom, I feel grateful. Thankful that my Mama insisted that I help her in the kitchen and learn how to cook from her. The exercise also taught me to have patience. And that the really good stuff requires time and extra effort and the result can be much more rewarding. 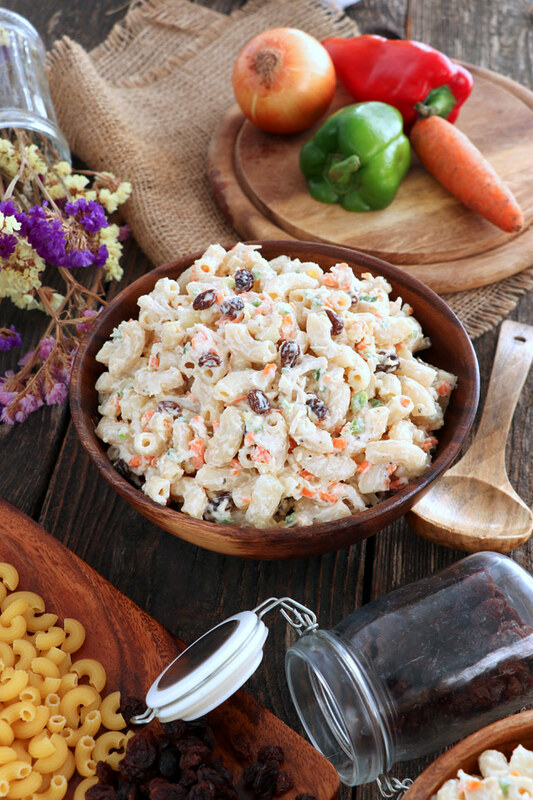 Try this easy chicken macaroni salad recipe, with loads of chicken, onions, carrots and bell peppers. With a little sweet surprise from raisins and pineapple tidbits. 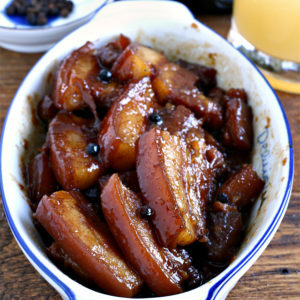 Perfect as a side dish or even for a snack. Cook elbow macaroni as per package instructions. Drain and set aside. Place chicken in a pot and fill with water just enough to cover it. Add a little salt and bring to boil. Simmer for 10-12 minutes or until meat is cooked through. Remove from heat and drain. Shred meat using 2 forks. In a large bowl, add all the ingredients, except the cheese, salt, and pepper. and toss until well blended. 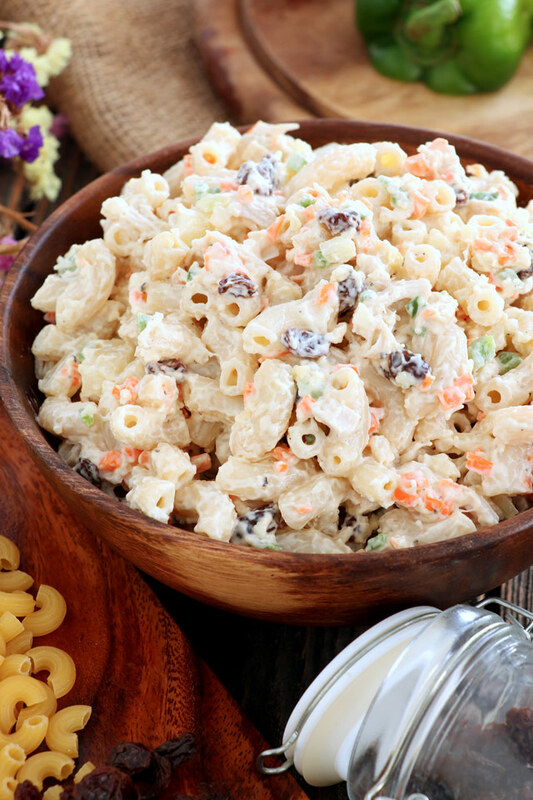 Grate the cheese on top of the macaroni salad and mix. Season with salt and pepper according to preference. Cover the bowl with cling wrap and let it rest in the fridge for at least an hour to give the flavor time to blend together. Give it another toss before serving. 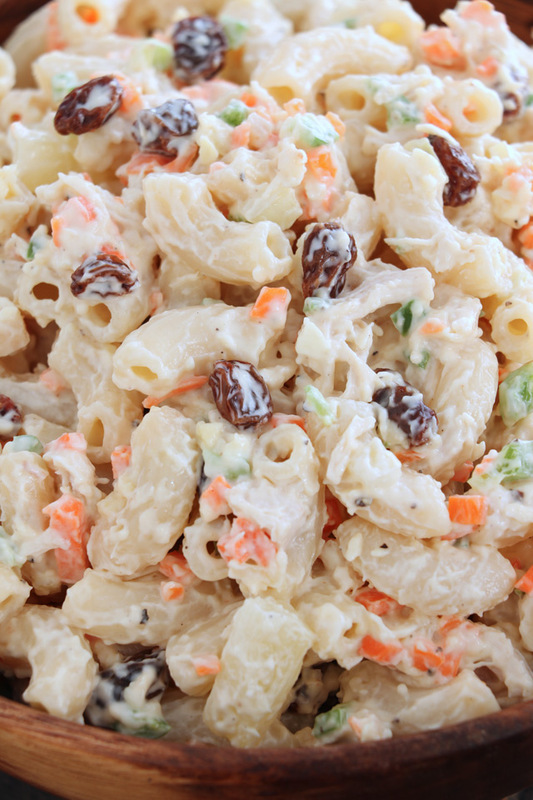 You can also make this chicken macaroni salad ahead and store it in airtight containers. Properly stored, it will last 3-5 days in the fridge. 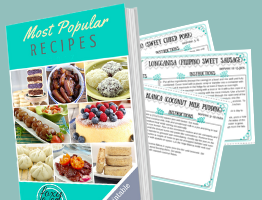 Love your recipes, simple & easy to follow yet soo yummy my kids will surely like it, looking forward to cook more of your recipes! Good luck, more power! Hi Ella, I am glad you are happy with our recipes. Thanks for your nice comment and happy holidays to you and yours.